take place March, 18-20, 2007. 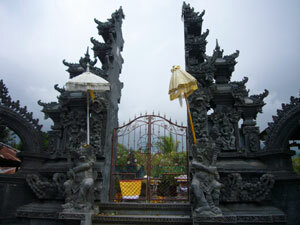 There is a curfew during every New Year’s celebration on Bali. All evil spirits shall be irritated by the means of this “Day of Silence”. Every religion or culture all over the world has their own way to define and celebrate their new year. For example, the Chinese have the Imlek year and to celebrate it, have, as they called it in their own language, “Gong Xi Fat Choy”. The Moslem societies have their Muharam year, and any of the people over the world using the Gregorian calendar, celebrate the New Year on January 1st. Melasti or Mekiyis or Melis (three days before Nyepi)_Melasti is meant to clean the pratima or arca or pralingga (statue), with symbols that help to concentrate the mind in order to become closer to God. The ceremony is aimed to clean all nature and its content, and also to take the Amerta (the source for eternal life) from the ocean or other water resources (ie lake, river, etc). Three days before Nyepi, all the effigies of the Gods from all the village temples are taken to the river in long and colourful ceremonies. There, they have are bathed by the Neptune of the Balinese Lord, the God Baruna, before being taken back home to their shrines. Tawur Kesanga (the day before Nyepi)_Exactly one day before Nyepi, all villages in Bali hold a large exorcism ceremony at the main village cross road, the meeting place of demons. They usually make Ogoh-ogoh (the fantastic monsters or evil spirits or the Butha Kala made of bamboo) for carnival purposes. The Ogoh-ogoh monsters symbolize the evil spirits surrounding our environment which have to be got rid of from our lives . The carnivals themselves are held all over Bali following sunset. Bleganjur, a Balinese gamelan music accompanies the procession. Some are giants taken from classical Balinese lore. 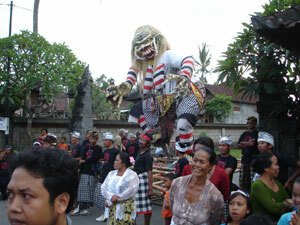 All have fangs, bulging eyes and scary hair and are illuminated by torches.The procession is usually organised by the Seka Teruna, the youth organisation of Banjar. When Ogoh-ogoh is being played by the Seka Teruna, everyone enjoys the carnival. In order to make a harmonic relation between human being and God, human and human, and human and their environments, Tawur Kesanga is performed in every level of society, from the people’s house. In the evening, the Hindus celebrating Ngerupuk, start making noises and light burning torches and set fire to the Ogoh-ogoh in order to get the Bhuta Kala, evil spirits, out of our lives. 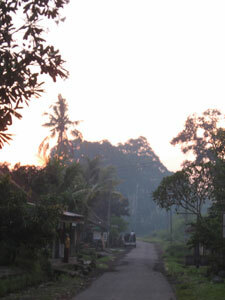 Nyepi_On Nyepi day itself, every street is quiet – there are nobody doing their normal daily activities. There is usually Pecalangs (traditional Balinese security man) who controls and checks for street security. Pecalang wear a black uniform and a Udeng or Destar (a Balinese traditional “hat” that is usually used in ceremony). The Pecalangs main task is not only to control the security of the street but also to stop any activities that disturb Nyepi. No traffic is allowed, not only cars but also people, who have to stay in their own houses. Light is kept to a minimum or not at all, the radio or TV is turned down and, of course, no one works. Even love making, this ultimate activity of all leisure times, is not supposed to take place, nor even attempted. The whole day is simply filled with the barking of a few dogs, the shrill of insect and is a simple long quiet day in the calendar of this otherwise hectic island. On Nyepi the world expected to be clean and everything starts anew, with Man showing his symbolic control over himself and the “force” of the World, hence the mandatory religious control. Ngembak Geni (the day after Nyepi)_Ngembak is the day when Catur Berata Penyepian is over and Hindus societies usually visit to forgive each other and doing the Dharma Canthi. Dharma Canthi are activities of reading Sloka, Kekidung, Kekawin, etc. (ancient scripts containing songs and lyrics). From the religious and philosophy point of view, Nyepi is meant to be a day of self introspection to decide on values, eg humanity, love, patience, kindness, etc., that should kept forever. Balinese Hindus have many kind of celebrations (some sacred days) but Nyepi is, perhaps the most important of the island’s religious days and the prohibitions are taken seriously, particularly in villages outside of Bali’s southern tourist belt. Hotels are exempt from Nyepi’s rigorous practices but streets outside will be closed to both pedestrians and vehicles (except for airport shuttles or emergency vehicles) and village wardens (Pecalang) will be posted to keep people off the beach. So wherever you happen to be staying on March19th in Bali, this will be a good day to spend indoors. Indeed Nyepi day has made Bali a unique island.The Visualisation of the Angel Being within the Human Being. 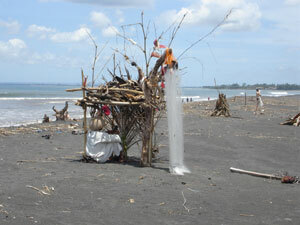 ° Performance-Artists worldwide will be invited to participate in the 24 hour event „Nyepi“. a – The artists travel to Bali and will realize the event together with the artists from Indonesia and/or other present visitors and participants of the project at any chosen location there. It will be a lieu in the country because the whole city life will be completely disrupted. No production – no discussion – just be quiet and less in movements as possible. b – Worldwide. The participating artists will realize this 24 hour happening in their home country, during a journey, at the place of their present being, alone or together with others. This can as well take place within any other project, while being on a vacation or in any other way. Thus any potential lieu worldwide, where the participating artist stays. This event will and shall be isochronous. For example 0:00 a.m. on the 19th of March in Bali equals 4 p.m. on the 18th of March in the UK and 11a.m. in New York on 18th of March. ° A website to document the event will be established. Only the names of the participating artist and names of the locations will be published there. No explanation, no depiction – simply the names and the place. This will be provided by ASA-European / E.P.I. Zentrum. Slow down, renew, standstill, the quiescence worldwide during one single day, calm via slightest movement. ° Charron noted down, that he recognized more brouhaha and turmoil in Florenz within the last ten years, then within the last 500 years in Graubünden, and concluded, that a polity can only endure, when it is possible, to “quiet and ease the spirit”. ° August 29th, in 1952, the American pianist David Tudor performed the world premiere of a new composition in New York. He sat down at the grand piano, closed the lid, persevered exactly 4 minutes and 33 seconds at his instrument and then opened the lid again. Transformation of traditions – to become tradition. That the idea and cultural traditions of „Nyepi“ shine from Bali all over the planet. That this day shall be performed annually, representing the first intercultural day of all the peoples of the world. 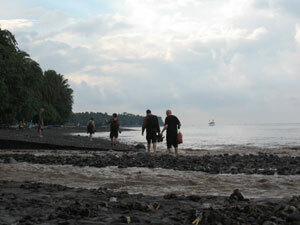 Nyepi – 2007” shall be transformed from a genuine artistic project to a cultural project. (or to anchor it under their various existing forms of written constitutional laws, etc..). That individuals are found, who delve into the further development of this project in their countries. ° To come to Bali, you have to find your support by yourself. The E.P.I. Zentrum, has prepared an personal application for you to ask for support. ( in German and English). If needed, Melati Suryodarmo and Lemah Putih Foundation can give you additional letter. ° The conference means only the 24 hours of silence ( Nyepi). The ritual by the Balinese people needs 4 day. Two days before and one day after Nyepi. 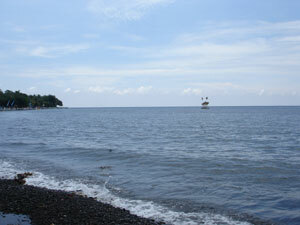 It is suggested to arrive at least 3 days before Nyepi, on the 16th of March 2007. ° Melati Suryodarmo offers a help to organize places to stay and a meeting place in a village called Bedulu, located in the middle of Bali. 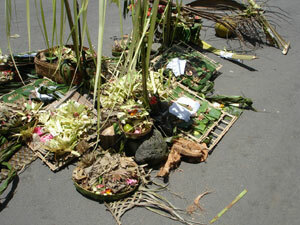 In Bedulu, “Nyepi” Ritual is still deep tradition and in very strong practice. In this village, there is a Pura Samuan Tiga Temple, which has a very strong inter-religious background and history. A simple open theatre and a simple village hall are located in front of the temple. ° Another possibility is to go to Bali to celebrate Nyepi somewhere in country-side with the people there and after the 24 hours you leave. 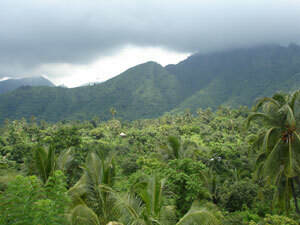 As another possibility, you may choose to stay at the hotel in Ubud area. We like the idea that performance artists from worldwide celebrate the conference in Bali and worldwide without having contact to each other. In this case it needs no condition, only your will to participate. ° You will be quiet for 24 hours on March 19th 2007. 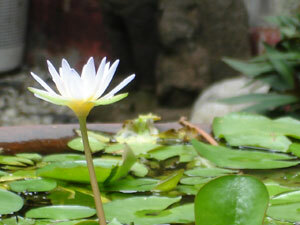 (Time in Bali) in Europe is to start March 18th 04:00 p.m. in England, later on this day in USA. ° In a private room or in some public space. ° You will do it alone or with some others, some artists or some people in sense, groups. ° You will do it with a press-information (Audience can see you be quiet and less of movements) or without any information for outside, without any audience. That’s all facts in moment. To ask for support, maybe you will and you have to start now. This event is organized by Boris Nieslony (ASA European) in collaboration with Melati Suryodarmo, Padepokan Lemah Putih Solo and the family of Mr I Wayan Gdhe Nuaja. near St. Anne’s Cathedral, city centre. ° Costa, Alexandre A.R. & dos Santos, Jorge Fernando (Public Performedia Home Country: Portugal. Beginning 18th of March 2007 at 16:00 p.m., during 24hours. Please not to disturb, we are in silence and quiet. If you want, go home and do the same. “an Unknown day”, a 24 hours of idleness. Starting March 18 at 11pm Manila time. be quiet for 24 hours, alone at home, in Basel, Switzerland. to be 24 hours in a for me wellknown ‘soundpsace’. The space is in an indian tradition andlocated in a schamanistic visionsland in Denmark. He is built up half in the earth and connected with worldwide placed other soundspaces. She will interrogate the schamane in Denmark about this facts. This Variation will be in total seclusion, to take pictures are not able. in nature by creating negative interferences with a chain saw. Describtion_She will particpate in Berlin. After so many years from meeting her in Santiago, Chile (at a party in _Alexander del Re’s aprtament), after flying together to Tierra Del _Fuego…. After meeting her in NYC….after so many years, months, _weeks and days….Marialuisa Ramirez Ernst is in Wawa, Poland. ° MacLennan, Alastair / Northern Ireland_Describtion:_will particpate 24 hours in a space in Belfast and open this space for any incoming interesrs and participants. Our performence called in french ‘ Soyons 9’, ‘being nine’ ‘being new’ . I haven’t choose yet all my partners. Bertrand who translate it for you. might see the performence in a place and what happen in an other part of the world joined by the same topic… Silence… it will be beautifull. Silence is the unical border line where the soul can reconize herself. Being quiet, it’s for men or women being full of the Univers, and for a short time maybe, he or her forgets troubles and as a dancer can fell the energy of happiness. 4 people will participate in Chicoutimi to your project. All the activities will take place at the Espace Virtuel Gallery in Chicoutimi (Québec)-Canada. shape in the top of this with sheet. with your action and move your self to the right 30 degrees and jump,spot is good in that way. basis of arguments about art and casual situation, about the performance that you make fouling this orders. But the most important is that you are participating in the The 15th Performance Art Conference. Will do this 24 hours. So, on Sunday, March 18th 2007, which is the 19th on Bali and Nyepi and at the same time the 165th birthday of the poet Stèphane Mallarmé, she wants to carry a dice in her pocket/hand, the whole day through, and bury an angel in silence. Luisa Accati – Il Mostro e la bella. My participation will be in public, in this day I am teaching at school, so I will teach by silence, I will write a text about silence, which I will send you later. participation from Borobudur Temple, Java.